So In 13 Days Time We Once again make the annual pilgramige to the USA & Chase Storms across the Plains, we are starting later this year with the first Chase day being Thursday 10th May. I will be landing in DFW On Monday 7th May to set everything up. The Season so far has been in fits and starts with no real pattern emerging other than big outbreaks every 6 weeks or so, La Nina is clinging on but is expected to go neutral any time soon, I am expecting a pick up in closeness of the risks soon maybe starting this Friday 27th in Kansas, there could be several Slight Risks next week as well as a zonal pattern looks like setting up, GOM Temperatures are still 2-4c above normal for the time of year and moisture return does not appear to be a problem this year. The W/B 9th April was shaping up to be very Interesting in the Southern Plains culminating in a Possible Big Outbreak on Saturday 14th April across Oklahoma, Kansas and Nebraska. So with just 1 days notice flights were booked to DFW From LHR & We arrived on Wednesday 11th April for 4 days of Chasing. Arrival day saw us clear customs by 2pm and head up towards Amarillo in readiness more for an expected Chase day in Western Kansas on the 12th. 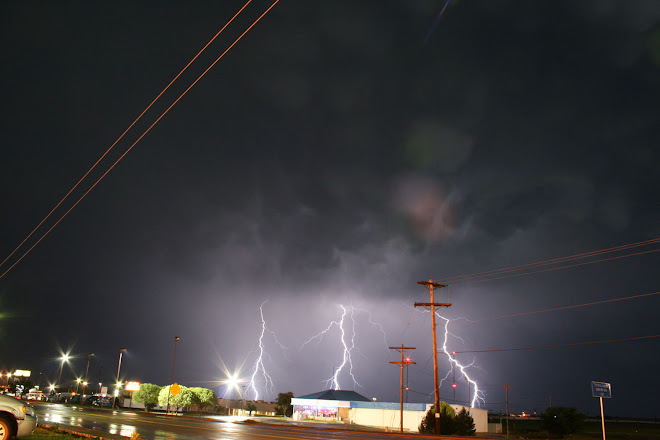 Upon arriving in Amarillo we headed west to some Non Severe Storms and got some practise shooting Lightning. The next day we headed up towards Pampa and then North towards the Target of Garden City. An MD Was Issued but surface temps were not responding how they should have due to a deck of Cirrus thus not allowing ample heating for the Dryline to fire off, Storms did form further North West near Goodland around the NE Side of a Surface Cyclone. We continued to gamble further South but alas it was not to be and ultimately Busted on the 12th, seeing as we had not chased much further North we were in a good position for Friday 13th seeing as we needed to be in Oklahoma. Fridays Chase Target was just South of Clinton and down towards SW Oklahoma. Storms fired earlier than expected and a couple of Supercells raced towards Oklahoma City, we had to let these go but more Storms were firing around the Eastern Texas Panhandle area. We followed 1 near Hobart Eastwards but it always looked quite grungy, more Storms were firing along the dryline further west so back out we went and sampled a couple of HP Supercells North East of Altus. We were treated to some very nice structure and Wall Clouds, the 2nd Supercell we got on then right turned so we followed it east. Again it morphed from grunge to nice Structure but with absolutely zero Inflow winds it was struggling, at around 7pm the LLJ Started to crank up and the Storm started to get it's act together, we went North and near Cooperton documented a Cone Tornado buried in the rain (My 50th Tornado). After this we went south and east of the Storm towards Apache and shot some Lightning, by now the storms had all congealed into an MCS. Upon awaking on Saturday 14th April we woke upto probably the biggest HIGH Risk area the SPC Had ever issued (3 Times the size of the UK) There were 3 main areas of Interest, the first was Nebraska North of a Lifting Warm Front, the 2nd along the dryline in Central Kansas and the 3rd down in Oklahoma again along the Dryline. I studied the models, charts probably about 5 times before finally selecting my chase target for this day, I ruled out Nebraska for 2 reasons, the first was timescales for our flight home on Sunday and the second for thinking the stalled warm front would be much further South and also the Surface Low was showing as in SE Colorado (Again Much Further South) I ruled out Oklahoma due to a lot of residual cloud left over from Friday's Storms and also the Cap looked almost thermo-nuclear down there. So In my mind I tried to picture how the day would pan out, I denoted the Dryline was much further West that morning as it was sitting near Amarillo. So the Thinking was Salina for Supercells that had fired off the Dryline, hit the Warm Front and rode along that boundary to the East, and that is almost what happened, what did not go to plan was how early these Storms Fired and it is this that ultimately cost me the Big EF4 Wedge ironically just North West of Salina. As we headed north along I-35 The temptation was too much to hit 2 Supercells head on along the 54/400 Highway out of Wichita, we would have a perfect Intercept near Greensburg, so west we went, upon sitting just east of these Supercells they were struggling somewhat, looking grungy and then cycling up before looking outflow dominant again, they were also racing off to the North East at between 50-60mph. So we had to play the stair stepping game, because the dryline was shifting east so was the initiation of the Storms, we headed back east towards Pratt, just making it over the top of the core of the next dryline Supe in the line, again this looked grungy, so down we went again to another near Medicine Lodge, this looked great at first, nice structure and it very nearly put a tube down near Zenda. We decided to follow this one for a while as the next Supercell in the line (And ultimately the last of the day down in Northern Oklahoma) was distance enough not to interfere with ours. Just North of Kingman our Storm organised enough to drop a very brief Tornado which formed to our West and sped across the road literally 200 yards in front of us, Power lines showered the road with blue sparks in front of us while we got hit by the Wet RFD And wrapping rain curtains. The first time we caught sight of the Wedge was when it was near Bluff City, we could see it when Lightning lit up the base from our location, I knew the Storm was heading North East so we went back North up the road we just came down, we sat a few miles south of the Rain Free Base and witnessed another Tornado near or just South of Argonia, this was a beautiful Cone Tornado that turned into a Stovepipe, as we headed East to Wellington we could see this Tornado morphing from Stovepipe to Wedge a few times. All the time I was plotting the course and knew ultimately that this was heading for the Southern side of the Wichita Metroplex. We took a Highway North out of Wellington and parrallelled the I-35. We finally caught up with the Storm again just South of Haysville, we stopped just south of Haysville and watched the now Wedge Tornado cross the road to our North, Green and Blue Power Flashes lightning up the Night Sky with Tornado Sirens blaring, we also knew that soon we were going to come across some significant damage which might halt our chase, that or we might need to help trapped people. North of Haysville we had to turn around due to Power Lines and Trees across the road, we went back east towards Augusta crossing the damage path a few times and finally caught sight of the now 1/2 mile wide wedge to our North again as it was tearing up Augusta, by now progress was almost to a crawl in Wichita due to fallen trees, sheet metal in the road and Emergency Cars all over the place so we cut off the chase and did not pursue the Supercell onwards towards El Dorado. We stopped for a while seeing if any help was needed but the Police and Fire/Ambulance Service seemed to have everything under control so we headed back South to Oklahoma City for the Night and awaited the Squall Line that was out west and was due to arrive at 3-4am. A very eventful High Risk, things could have gone better for us and it was frustrating at times but we still witnessed 5 Different Tornadoes across Kansas. Some Pictures from the Chase Days above. 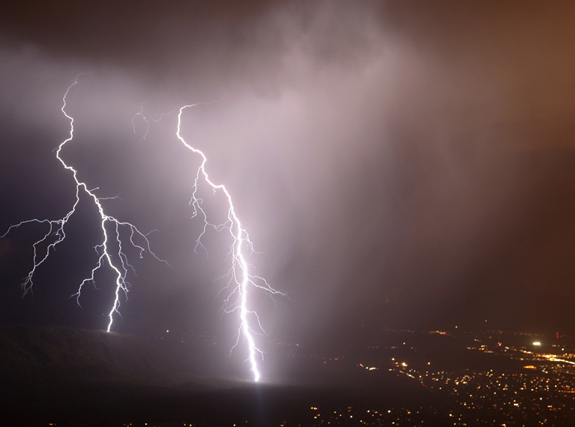 This day will go down as the best day we have ever had for Lightning Photography on our Tours. Granted this is not a Tornado Alley chase but gives you a flavour of what the Lightning can be like. The Usual HP Supercells cannot replicate this type of Lightning in the Plains but Elevated Hailers can when the EML Becomes favourable for Summer type Hailstorms. On the 22nd August we chased some marginal diurnal storms around the Tucson area which all dried up before Sunset and seeing as we were effectively done by 6pm we grabbed some food and then went on the drive upto Mount Lemmon more for the scenery over anything else. We stopped at various scenic checkpoints along the way and I even said on the 22nd whilst stopping at Windy Point (Elevation 7,000ft asl) looking down on Tucson below (How good would it be to shoot a Storm from this location) Exactly 24 hours later we would get our wish in spectacular fashion!! The next day we left Phoenix at 2pm and grabbed lunch at Casa Grande, on the drive down the Interstate we sampled various Storms making there way across the Desert Floor and noted a bigger MCS System down by Tucson. Onwards we pushed but as witgh the previous day Storms were struggling to keep their acts together in the Tucson Valley, as we drove through another marginal Duststorm occured (Haboob) and we had some fun with the blowing Sandstorms. As with the previous day the radar looked deviod of storms at about 6pm. We once again grabbed some Pizza and then drove towards Mount Lemmon. The drive from the centre of Tucson to Mount Lemmon is about 45 minutes so off we set again. This time though I was noting a possible Outflow Boundary extending from NW - SE on radar and kept an eye on this closely. We got to Windy Point at about 7pm and literally as we parked all saw a huge flash from our SE. This was a developing Storm that was not even on radar yet but was showing on the Barons as Lightning Flashes. Everyone got set up and the next 90 minutes was set to be the most incredible experience we have ever had. The radar was now showing a back building line of Storms from just SE Of Tucson extending down towards Benson. The Storms seemed to impact the East side of Tucson (Closest to Mount Lemmon) and then dissipate as they moved away from the elevation. At our Location we always had clear skies above us and the Storms remained within the 5-10 Mile Range. The Cg rate was about 10-20 per minute. Being level with the Base of the Storm allowed us to capture some remarkable images and still to this day our best Photography of Lightning which will be hard to beat.